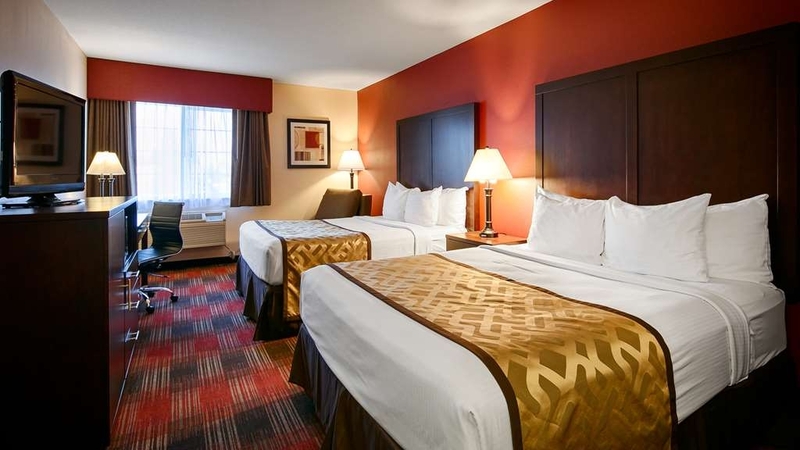 El Best Western Dallas Inn & Suites se encuentra en el centro de Dallas. Venga y disfrute de las mejores atracciónes turísticas cerca de nuestro hotel. Precios bajos garantizados y ofertas exclusivas. Este acogedor hotel de Dallas, Oregón, está situado a poca distancia de una gran variedad de fantásticas atracciones, entre las que se incluyen varios viñedos locales y la Universidad Western Oregon. Las amplias habitaciones de este hotel Best Western® cuentan con acceso a Internet de alta velocidad, televisión por cable vía satélite con HBO®, cafetera para una taza, escritorio, artículos de tocador gratuitos en la habitación y mucho más. Durante su estancia en este hotel de Dallas, Oregón, los huéspedes también podrán disfrutar de servicio de lavandería, servicio de estacionamiento y un gimnasio. Los huéspedes de este hotel de Oregón podrán comenzar su mañana de la mejor forma con un desayuno caliente gratuito. Independientemente de las preferencias gastronómicas que tengan usted o sus compañeros de viaje, podrá encontrar una gran variedad de restaurantes en un radio de menos de 1,5 kilómetros de este hotel de Dallas, Oregón, entre los que se incluyen el Restaurante Hong-Kong, Figaro's Pizza®, Rio's Tavern y North Dallas Bar and Grill. Muchos de nuestros huéspedes prueban su suerte en el cercano casino Spirit Mountain o acuden a realizar una terapia de compras al centro comercial Salem Center. Los visitantes también podrán disfrutar del hermoso paisaje de los jardines Oregon Garden y las playas de Lincoln City. Ubicado junto al extremo occidental de Salem, Oregón, el Best Western® Dallas Inn & Suites se encuentra a poca distancia en auto de una gran cantidad de bodegas locales de Oregón, donde los huéspedes de este hotel de Dallas, Oregón, también podrán relajarse y desconectar contemplando el hermoso paisaje. Una gran cantidad de huéspedes de este hotel de Dallas, Oregón, escogen nuestro establecimiento para asistir a los diversos eventos celebrados en la zona, entre los que se incluyen torneos de golf, los acontecimientos deportivos de la Universidad de Oregón o diversos eventos locales en el recinto ferial del condado de Polk. Aquellos estudiantes que deseen visitar a estudiantes o profesores de la Universidad Western Oregon o familiares y conocidos en el Hospital Municipal Valley o el parque para caravanas Forest River, encontrarán que este hotel BEST WESTERN de Oregón proporciona un fácil acceso a todos estos lugares. Si desea disfrutar de una memorable estancia con un servicio excepcional en este fantástico hotel de Dallas, Oregón, realice su reserva en línea en el Best Western® Dallas Inn & Suites. "A Great Place to Stay in Dallas, OR"
Upon arriving, the hotel lobby was inviting and clean and front desk staff was friendly. Continental breakfast was good and had a variety of options. Room was spacious and clean. We were in town for a wedding and had a lot of stuff to bring up and noticed there isn't an elevator. Staff did let us know he would help us take stuff up, but it wasn't a deal breaker. Just something to keep in mind. Overall, would recommend to anyone staying in Dallas! Room was very spacious, even with four girls and all the stuff that come along with! Very clean room and continental breakfast was good. The only thing I found strange was there was two floors but no elevator. Had to make a few trips. Overall, would recommend to anyone staying in Dallas! Nice grounds, large rooms, friendly staff. We stayed for a wedding in the area and enjoyed the fresh cookies and fruit at check in. Room was clean and large and we were told they were newly remodeled. Would recommend. "Doesn't care for the disabled"
This hotel has no elevator and 3weeks in advance a ground floor room was requested due to the fact that traversing stairs is extremely difficult for us. Also we reported that our service dog would be staying. Upon check in we were assigned a second floor room and they told us no note was in our reservation about needing a ground floor or about the dog. They did not try to rectify the situation at all. We were supposed to stay a week. Needless to say we tried to brave one night in hopes that they would fix the situation being that we were going to be spending quite a bit of money there but no joy. The stairs were way too much. There was a very fragrant odor in our room. The showers didn't drain while you were using it. "Not a good place to stay!" Once again we drive from Nevada all the way to Oregon on our yearly trek to visit family, and once again stay at this motel. The manager booked our room herself over the phone. Andrea took my credit card to hold the room until we arrived. When asked can I change cards when I get there she said YES. After a 15 hour drive, my husband (who isn't well) our daughter and two grandchildren arrive exhausted, and the person at front desk swipes MY HUSBAND'S card which is supposed to override my card and says no problem. Also they HOLD a $250 deposit so be prepared for this extra charge as well as overpriced rooms. A few days go by and I call my bank to check on my account to find it is OVERDRAWN!! I call again and find out the motel did not take the money out of my husband's account they messed up mine and took it out of my account which did not have sufficient funds to do that!!! causing me a really bad time trying to straighten it out. It was the weekend and the front desk clerk who denied having been the one who did it and we knew she was!! said no manager on duty there on weekends. We wait until Monday , have a meeting with the manager she says she doesn't have a clue what happened we spend the precious little time we have going from the bank to phone calls to bank manager to motel manager over half a day wasted,!! In the meantime my account is overdrawn by no fault of my own.. DO NOT STAY IN THIS NUT MOTEL, THEY DO NOT KNOW HOW TO DO THEIR JOBS AND IT WAS A STINKING MESS. The breakfasts the manager said were better now was NOT . The orange juice machine broken, the girl who cleans up will take your plate right out from under your nose..The eggs are soggy and the biscuits hard as a rock the bacon half raw. Their are only 4 tables in the breakfast room no place for people to sit.. The bathrooms no grab bar in the tub and so slick my husband could not take a shower the whole vacation!! I ask the manager and she said Oh we have the grab bars just not sure where to put them! WHAT?? in the meantime a lawsuit waiting to happen. No elevator. My daughter got a chemical burn from the hot tub on her arm they don't take care of it at all.! The sofa is a pull out bed in the room and the springs are sticking up through the mattress it is unbelievable .Sleeping on it was horrible. DON'T STAY AT THIS CRAZY PLACE. FOR THE MONEY ONE CAN GET A MUCH NICER PLACE IN SALEM!! We will never stay here again. They caused us a lot of grief and not worth the money anyway. "Accommodating & Friendly Staff made our stay most enjoyable!" My husband and I stayed at the Dallas Best Western for 5 days while visiting family. The hotel is standard fare with the basic rooms and rates, small fridges & microwaves, hairdryers, and ironing boards, amongst other amenities. We found the rooms clean and well-kept during our stay. However, what makes this an above average hotel is the accommodating and friendly staff. They are beyond helpful as I discovered when we needed to stay an extra night outside our reservation, and they obligingly found a vacant room just 2 doors down from our current room, which made it easy to move our stuff such a short distance. They were apologetic about not being able to keep us in that room (it was 2 queens & was needed for another guest's reservation) and asked if a king would be alright. We were just thankful they had a room on a weekend, and one so close by. They also serve a decent breakfast daily, maintained by a very kind young lady who kept the breakfast room clean,supplied, and would even bring food, silverware, etc. to us when she heard us say we needed something. Dallas is such a friendly town with a ‘Mayberry' feel, and this hotel's staff was just as friendly as the town. We will definitely stay here again when visiting in the future. Hello, we stayed at this hotel from 06-11 to 06-14 and it was nice and clean. The staff was friendly and professional. We were greeted by Natasha, she had a warm smile and helped us with check in. Even though this hotel did not have an elevator, the stairs were laid out so that they were an easy climb. Natasha even offered to help us carry our luggage upstairs. The room was clean and even the remote had been sanitized and placed into a bag. "Clean room and great staff!" I stayed here with family for one night and let me just say the room we stayed in was very clean! Good job housekeeping! The man at the front desk was helpful and very nice. Didn't catch his name but he was great! All in all a great hotel to stay in. Lovely staff. Quiet neighborhood. If you happen to be in Dallas for a night, stay here! They also have free breakfast in the morning which was great! Room was spacious and comfortable. Asked for extra towels and was asked if we really needed them. Check you bill. They quote you one price and charge another. I noticed mine too late after I had left. 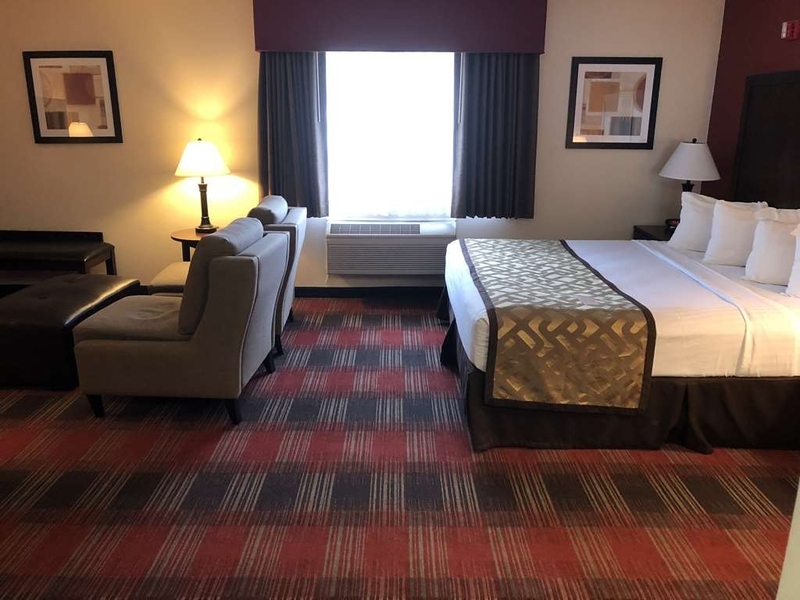 "Great Service and Amazing Staff"
The Best Western Dallas Inn & Suites is definitely the top choice of places to stay when I travel to Dallas. The staff and manager are truly outstanding and make me feel at home. The rooms are always extremely clean and have all the amenities I need. They gave away my reservation, but then gave me the managers room. Wasn't the overall the most nice experience I've ever had with a hotel. Would do it again every time. It's in a great location with all you can ask nearby. Yet it's quiet at night and sleep came naturally. I had to book a room in Dallas last minute for a family memorial service. This hotel was perfectly adequate, had pleasant staff and rooms/amenities as expected. Very satisfactory. Brief trip, did not have an opportunity to use the fitness center. "Not Terrible but its The Best in Dallas"
This place is decent for a place to sleep. When you travel for work like I do you tend to see the little things. This place could use a remodel. Most of the other BW hotels have already done that. Rooms are clean! Food is typical BW fare. "Caring staff and excellent service"
We stayed in Dallas for one night and found this hotel to be a gem. We enjoyed the clean room and facility in general. And, the breakfast was excellent. But the most remarkable part of our stay was the found in the extremely helpful and caring staff. They were very helpful both at check in and check out. On the whole, I would absolutely stay at this hotel if I were in the area again. Wonderful place to stay with an attentive and friendly staff. Very Clean rooms and comfortable beds. The breakfast was amazing with a nice variety for everyone. Great experience! We will be back for sure next trip to see my niece at WOU!! "Courtesy and competence in the top 1%"
I have stayed at most chain hotels and many others -- sometimes for several months of a year. This facility, its staffing and management operation are SUPERB. The attention to detail, prompt response to special needs requests showed flexibility, a positive customer-service attitude and was guided by management and personnel expertise that is among the best in the industry. This hotel was chosen based on previous reviews, and the reviews were spot on. All was as described. The hotel was very conveniently located for my business, close to the stores I needed, and within walking distance to a very good restaurant. 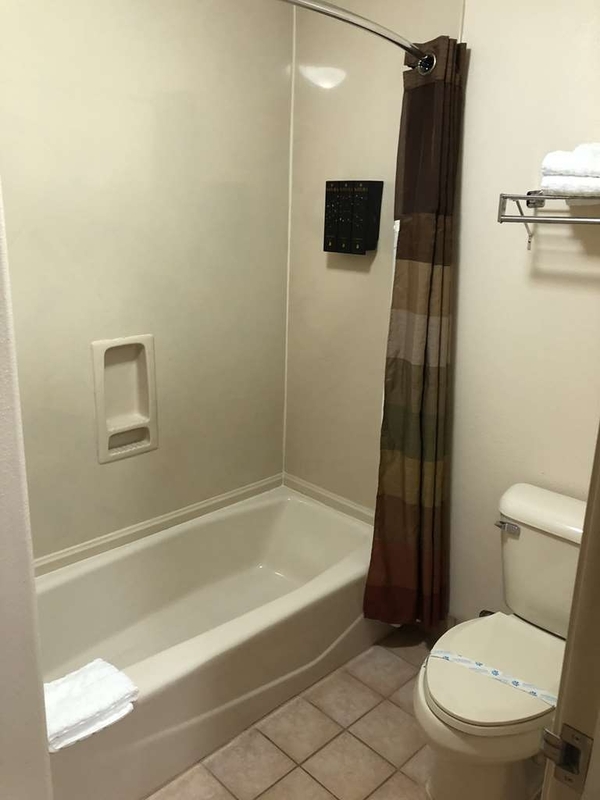 "Best Western Dallas Inn & Suites - Dallas, OR"
Very clean and nice decor. Beds were comfortable, and lots of bed pillows. Kelsey at the front desk - exceptional employee for this property. Very helpful and accommodating. Breakfast was okay - have had better. Eggs were runny and bacon was so thin - it crumbled when picking it up, other then that food was good. "Excellent service and vey clean." We will definitely return. Bed was very comfortable and room was very clean. Having shampoo conditioner and body wash in the dispenser was great. Our family enjoyed the free breakfast and we appreciate Kristy awesome hospitality. We will definitely come back. "Clean, Comfortable, Reasonably priced, & Friendly Staff"
We use this hotel twice a year for our semi-annual conference. You can always count on friendly staff, easy check-in, clean & comfortable rooms. The continental breakfast was decent and the jacuzzi hot tub and fitness facility are nice. "Wow such a great family place!" I? stayed here w my husband and two kids. It is our second visit, the hotel is clean and beautiful! We could tell that they have done extensive work on the facility as well as the staff. Everyone was so accommodating. We had a chance to meet the manager and we were very impressed with her professionalism. She seemed genuinely interested in making sure we had a great stay. The breakfast room is so well organized. All of our needs were met quickly. Great job improving! We will be back and tell our friends about it!! 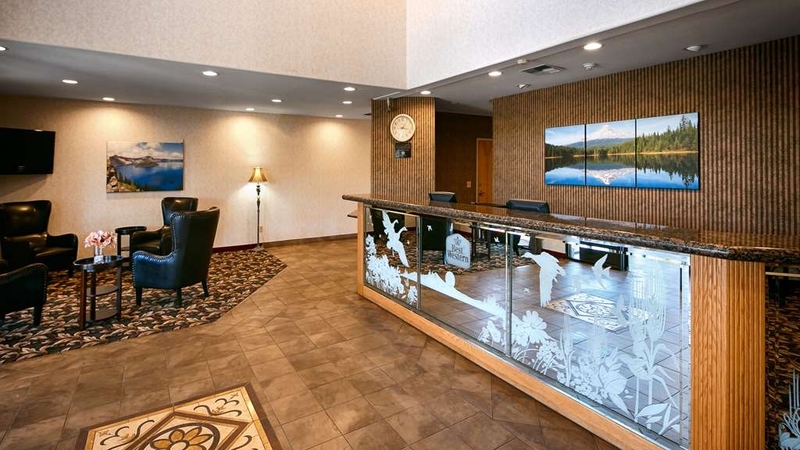 So glad we choose the Best Western Inn and Suites in Dallas, Oregon! We were visiting friends in Salem and enjoyed our stay here. Staff was very friendly and professional, room was clean, beautiful breakfast room and quiet. We spoke with Andrea before booking and she recommend some awesome wineries nearby and places to have dinner. Very helpful. We will be returning again! Thanks for making our stay wonderful! "Overpriced and very rude staff"
My husband, two grandchildren, myself, and daughter stayed here in July 2017. We are from out of state, and because it is close to our annual family reunion we choose to stay here when we go back home to Dallas, Oregon. The drive to get here is about 16 hours and we are very tired when we arrive. When we stayed here a few years ago they were very accommodating the staff was friendly and the complimentary breakfast was great! The prices were high for this area, however. But there isn't many motels available in Dallas. In July 2017 we stayed here once again, and found the staff to be very rude. The Middle Eastern man at the front desk was horrible. They did not want to give us towels when we asked. The girl that was cleaning the kitchen area while people ate was weird. She just walked like a zombie, did not speak to people , the food was horrible. The juice machine did not work, and the eggs were soggy. They watch you like a hawk afraid you may steal something I guess. It was a terrible experience nothing like two years ago when we stayed here. The price for the room was about as expensive as when we went to Disneyland. And the area doesn't have any entertainment at all. No restaurants to speak of if you want to go out for lunch or dinner. So there is no reason to charge what they do. The beds were hard, and the bathrooms very small. The man from the front desk and the woman who is in the dining areas sprays some sort of chemical over the coffee makers and it was disgusting. There is a tiny pool/spa inside and when we went to use it the kids were not welcome. We will not stay here again. And I advise people to stay in Salem at a place where you are welcome! Salem is about 19 miles away. The staff at the front desk went above and beyond for us. They were helpful and kind. The breakfast lady was cheerful and engaging. I would recommend this hotel as it is in a convenient location close to food and shopping as well as the major thoroughfares in the area. Was in town overnight due to business and had to quickly find a place to stay over. Stayed at the Best Western. The room was very comfortable and clean, although I felt a bit overpriced at $120 for November. My room was quiet, but several guests came in late in the evening talking very loudly. Continental breakfast was very small and coffee was empty in both carafes. Overall the stay was pleasant, the only true negatives for me were-the morning breakfast experience and the fact that Finding someone behind the desk is very hit and miss. When I went to check out, no one came to the Coulter's. I waited about 5 minutes then simply tossed my room card over the counter. Will stay again. They have made great improvements to the motel inside and out. The decorating was very attractive. The staff was also very helpful and professional. The hospitality for the breakfast was excellent. We stayed at the Best Western on our recent holiday. The desk clerk was super helpful and polite. Our room was comfortable and quiet on the parking lot side. In the breakfast room next morning we overheard a large group complain they had to listen to a car alarm all night in a nearby neighborhood on the other side of the hotel. The breakfast was decent, lots on offer, bacon, scrambled eggs, waffles, fruit, coffee, juice etc. This is a very neat and clean hotel. Two floors but no elevator. The desk clerk offered to carry up our heavy suitcases. Excellent service!! 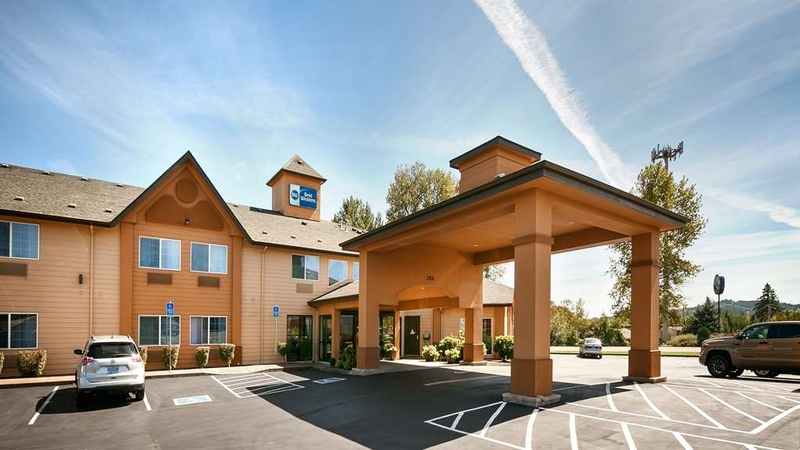 Would recommend the Best Western in Dallas, Oregon to travellers visiting this gorgeous area! "Best Hotel in Dallas, Oregon"
"No place better in the WOU area"
We often visit our daughter staying at WOU and I always try to book the BW in Dallas, OR as soon as possible. 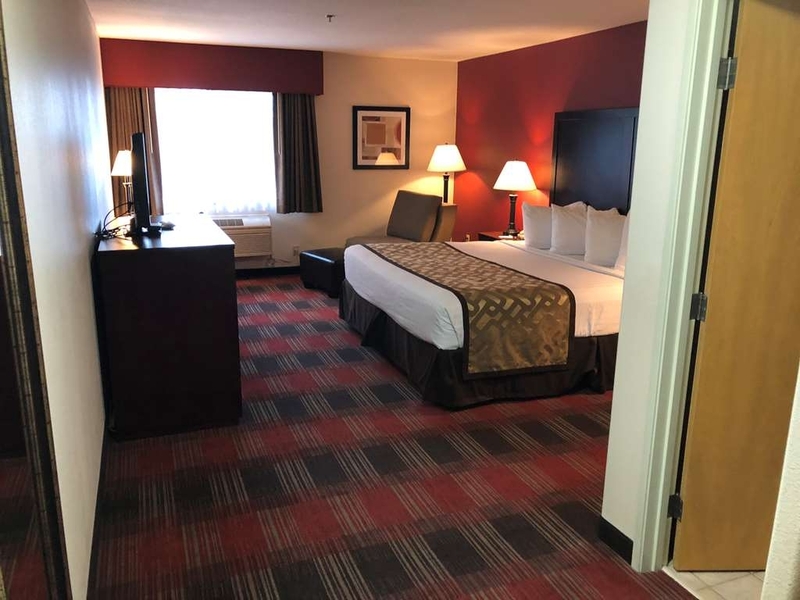 The hotel is a short drive to the campus and is clean, comfortable and has the most delightful staff. I also appreciate the breakfast which is included, so I can feed my twin boys well before going off to our activities. It is also close to a WalMart and a Safeway in case you have forgotten or need something. Glynis, We are so glad you enjoyed our staff and the amenities we provide. We know twins can be a handful so we are glad to hear our breakfast is convenient for you and lightened your load. Our staff is here 24 hours a day so please don't ever hesitate to utilize our staff. We hope to see your family return to Best Western Dallas Inn & Suites. We appreciate you taking your time to review our property. Going to visit grandson at a nearby college, comfortable room close to WOU. helpful services The local town has several nice amenities, good for a local student to know. College town not as big as town where Best Western is located. We were tired and as usual, BW was there for us. Excellent property! Excellent service! The location was / is very convenient to the work we were doing and all of the staff were informative and helpful for our purposes. Clean, great staff and plentiful breakfast. Great location to services and downtown. Wi-fi had easy log on and security. I have stayed at this location for my last three visits to Dallas Oregon. I will stay next time also. We had driven 6 hours and we pretty tired. We were on the second floor. NO elevator??? We had to walk up several stairs and my sisters were having trouble walking. Not good!we found ourselves going in and out several times. So it was quite unpleasant for them.. Next time we'll ask. This hotel was very short-staffed. Upon check in, there was one young man with a long line of people and no help. Upon check out, the woman responsible for breakfast service was also checking out guests. She was overwhelmed. In addition, there is no elevator to the second floor. When carrying luggage, you better make sure you can make it up the stairs. This is our second stay at this hotel. It is the best accommodations within a reasonable distance of my family who live there. Both times we have had a good experience. The room is clean, properly stocked and outfitted. The staff is very friendly and helpful. This is not a five star resort by any means. If you are looking for exceptional quality in finish and freebies you will be disappointed. But, I don't believe you will find that place in this area. However, if you are looking for a nice, friendly, quiet, well-maintained and operated hotel, you will be quite satisfied. 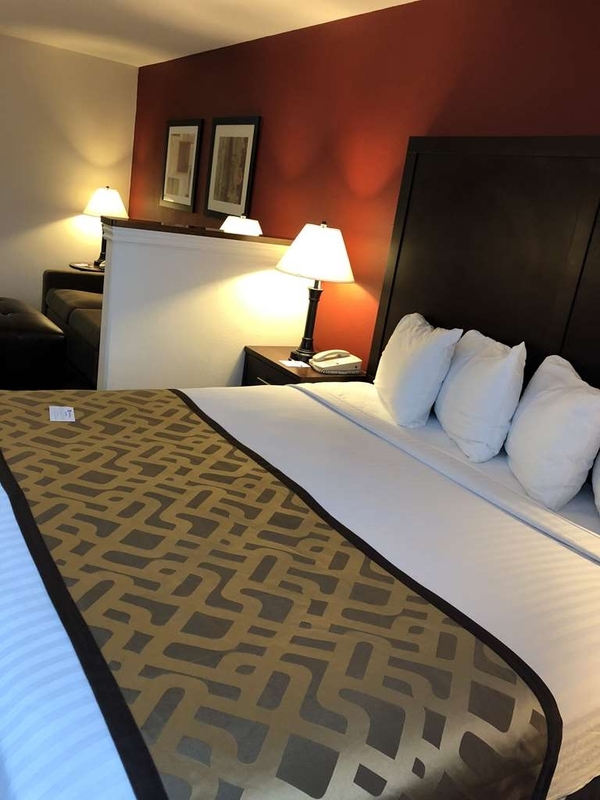 "Another great stay at BW Dallas, OR"
A great place to spend the night. Staff is friendly and helpful and the rooms are clean and spacious. This has become our "home away from home" when visiting the Dallas area. A special thank you to Rafael for his kind assistance on several occasions. The only down-side is the lack of an elevator and a small breakfast area, but these are relatively minor inconveniences for most people. Thank you, Dallas BW, for making our recent stay so enjoyable! "PET OWNERS BEWARE--CALL THE PROPERTY BEFORE BOOKING"
Tripadvisor states on their site that this property allows pets. So I made a reservation for a three night stay under this premise. Only last evening I was reviewing the confirmation I received, which stated that pets are NOT allowed. After two phone calls to the property, they would not budge. They stated they allow service animals only. I had to quickly find another proper that allows pets. Tripadvisor, you and each property you promote need to verify the information you have on your site. The room that was paid for was listed as a King Suite, it turned out to be someone's residence. It had no amenities that should have been in the room. A/C working, door knobs falling off, towel racks falls off wall. Closet had not way to open unless you opened at the bottom. Closet was a storage area for chairs and 2 roll away beds. Furniture was blocking walkways in living room and bedroom. No lamps only overhead lighting in living room and bedroom. This is the worst Best Western I have stayed this entire trip. Sharon, On behalf of our entire team, I would like to apologize for not exceeding your expectations. Your satisfaction is important to us and we will be using the feedback you gave us to implement improvements to ensure we offer a better experience for guests in the future. I hope that you will consider staying with us again so that we can have another chance to provide you with a superior experience. If I can provide any assistance, please don't hesitate to contact me directly at 5036236000. The exterior was very clean, observed on 2 mornings staff walking the grounds and picking up litter. All security features were in place and working,night lighting was very good (exterior). Rooms were clean and quite quiet as I usually do not stay on lower floors, accepted room assignment on first floor out of curiosity. Breakfast was adequate and kept fresh and as full as possible. The room is well appointed as for seating but kinda small, visiting soccer team was there so a little tight. All staff were in professional appearing attire, looked very good. A great stay! The hotel itself is very well located, and the grounds are near and clean. Every staff member was friendly and helpful - But the breakfast staff member was the absolute best! She had everything running very well and she was extremely helpful. 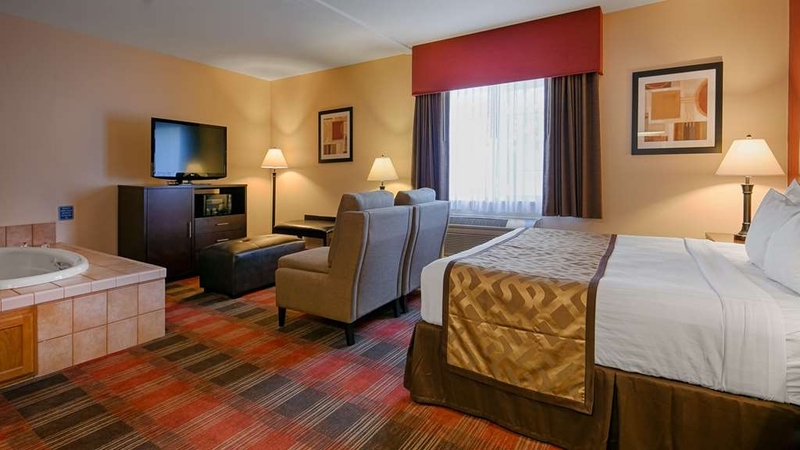 Clean spacious room and great courteous staff ,price was very reasonable ,includes breakfast,!! We would stay there again.We are rewards members and our room was up graded with out asking, Thank You!! This review is based on one night stay. Pros: Breakfast was good Bed sheets were crisp and clean Bed was comfortable Front desk was welcoming and accommodating. Priced lower compared to other best westerns Cons: Bathroom was overlooked because the soap and shampoos weren't refilled and there was a used towel hanging on the shower head. That really wasn't a big deal because the rest of the room was clean and customer service was nice. No elevators Would stay again. We were in Dallas to visit family. Although a little higher priced than other Best Westerns, it was worth the price to have a great location close to family. The rooms were very clean. The decor was a bit dated. But the beds were very comfortable and the AC worked great. The staff were extremely personable and helpful. "Dangerous for infants, would be one star but the breakfast person was so personable. Staff great, management not." The crib provided did not have the proper equipment. They provided a sheet that was designed for a queen bed. This is dangerous. DO NOT USE. Luckily the bride's mother came to the rescue with a properly equipped crib. The hotel management did not apologize. The front desk did let me know the management was informed. However management never apologized. Hotel was out of toiletries and seemed to have been for a while. I was here for a wedding and they spread us all over the hotel. If a pool has jets it should be much warmer. This seems to be the way they like it, but it is odd. There have been other complaints but management does not seem concerned. However the breakfast person, was delightful and let us relax and enjoy time together. I believe her name was Allison? The front desk and housekeeping staff were also very warm and friendly. The management made booking a wedding party nightmare as well. I tried to organize a group, but management made it exceptionally difficult. Just average, but what do you expect from a very small town? In fact it was clean! but BEWARE, there are no elevators to the 2nd floor. We were there for business, they assigned us a 2nd floor room, but when they said to walk the stairs, I said no! Don't bank on their free breakfast! It was a generic continental breakfast...they did have a little waffle maker which was not good. Apparently they had biscuits and gravy and some sort of meat, but by the time I made it to eat was was about 20 minutes before they closed it...it had a horrid smell! I was not about to even attempt anything in there it smelled that bad. I ventured out to starbucks around the corner. "Very Friendly and Extremely Helpful"
Quiet and helpful. Good spot in Willamette Valley that doesn't break the bank. Rafael was very helpful and super kind. We would definitely stay here again. We had a 1st floor room but could not hear anyone upstairs or outside. "If there was another hotel in town, I'd probably stay somewhere else." We had a reservation for a king suite for four nights. Upon arrival late on a Wednesday night, we were given a room on the second floor, and I was very surprised that they did not have an elevator. I have a bad leg and am not supposed to climb stairs, and my husband is 75 years old. They said they did not have a room on the first floor, even though the parking lot was quite empty. I struggled up the stairs (at least the desk clerk carried my bag.) The room was nice but the bathroom fan was so loud we couldn't talk to each other when it was on. The next morning at 8:00 a.m. we asked for another room. They said they had another one and we moved in right away. I don't think someone could have checked out and the room cleaned before 8:00, so I think it was available the night before. It was a smaller room, a standard queen, and I assumed the price would go down. We were then told it was an upgrade, but they were going to let us have it at the same price. When I questioned that, they wouldn't give me a straight answer. I told them their website described the types of rooms they have, and it definitely was not an upgrade, and they didn't listen. It was also the worst room in the place - right across from the front desk, the window was next to the front door, and it was across from the ice machine. We heard everyone coming in and out and talking at the front door, and the constant running and noises of the ice machine. The second day in that room the weather got very hot and the loud air conditioner ran almost constantly. When it ran that much, there was a bad smell coming from it. We complained again, and finally we got a king suite on the first floor which was much quieter. Too bad we only got to enjoy it for one night. On the plus side, breakfast was good. When we complained that the tub was quite slippery and I was afraid of falling when taking a shower, the manager went out and bought a bathmat for the room. Went for family reunion and booked two nights. Hotel made a mistake and only booked it for one night. I could not open the confirmation they sent me by email so I could not confirm the reservation was correct but assumed it was because I asked for two days they repeated the correct reservation back to me. They would not admit to their mistake and would not book us for the second night because they could get a higher price for the room than we paid from someone else and they claimed to be full. The room also had the do not disturb sign missing and the conditioner was empty. There is no elevator at the location so getting luggage upstairs was trying. The room was great.. Had an extra large corner room with lots of room and comfy beds. Breakfast was sufficient but not the usual standards of Best Western. They offered waffles, boiled eggs, yogurt, bacon assorted breads and gravy with no biscuits in sight. Would stay here again but an elevator would really be helpful. This hotel is in the middle of wine country. 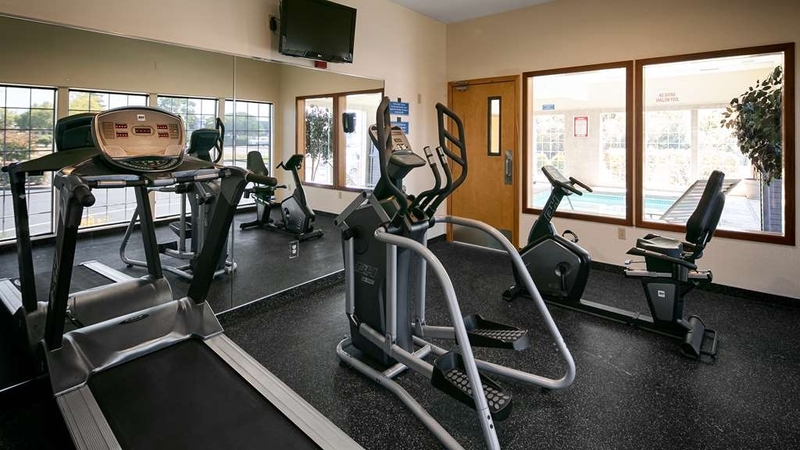 The rooms are large and the fitness center was great. It is located within walking distance to almost anything you could want. We will stay here again for sure. 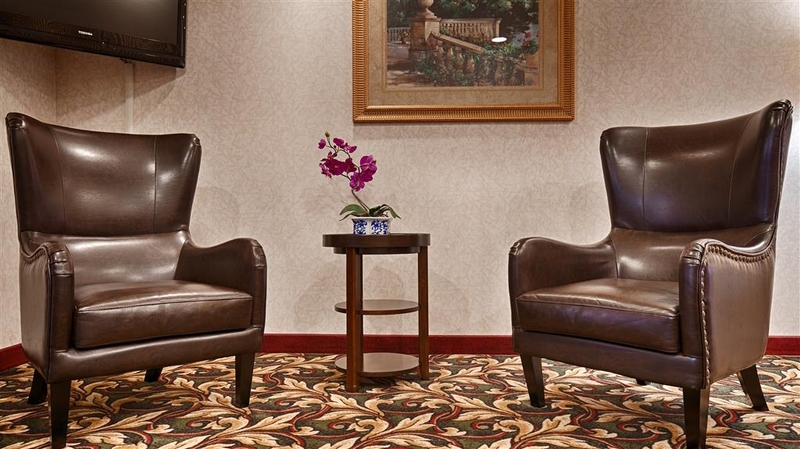 The Dallas, OR property, while not new by any means, is still well maintained, and quite conveniently located for our meeting needs nearby. However, we found the rate for this property to be excessive compared to the majority of comparable BW properties across the country. "Best place to stay in Dallas, Oregon"
Convenient, clean but a little pricey. Quiet - makes one want to move to the country. There is a Safeway across the street. The bathroom was updated, since the last time I was there, which was nice. Bed was comfortable and could watch a movie on the big screen T.V. as I unwound from a long hot drive. Booked a 2 night stay, king room 2 months in advance of graduation weekend. After a 7 hour drive, we pulled up and unloaded vehicle onto cart only to find out our room was on 2nd floor with no elevator. Reloaded luggage back into car then hauled it all up the stairs. Opened the door to our room and found 2 queen beds. Went down to the desk and was told that was all that was available. Front desk clerk appeared to be a 16 y/o who had no regard to any type of customer service and wrote down the name and number for manager who would not be available until Monday. I called the customer service # for BW and the gentleman I spoke with said he would put me on hold and reach out to hotel. After several minutes he came back and said they were not answering the phone. I went to the front desk and nobody was around. After about 5 minutes the kid came rolling up on his motorcycle. Who leaves the hotel unattended and what Manager would leave the monkeys to run the zoo on a busy weekend? BW customer service were helpful in getting the room situation straight. We were informed that our reservation had been changed that day so I can only assume it was done to accommodate someone other than us. Later that evening we were given a bag and an apology for the mix up and inside this bag was 2 itty-bitty bottles of water and 3 granola bars. Wow, it was almost an insult. We were over charged for our room from our original reservation and as of this date have received no resolution. This by far is one of the worst hotels I have ever stayed at and in the future will stay out of town and drive the 20 minutes in to Dallas for my family visits. "Second stay in 1 year"
I would recommend this hotel. The staff went beyond what was required to make sure we were comfortable and taken care of. I don't understand their policy with a debit card - so they wanted my credit card. Up until recently, I did not have a credit card by choice. The breakfast is good with plenty of choices. As we drove out of the Best Western Dallas Inn & Suites, my wife said to me, "Well, that wasn't that bad," and I replied, "Yeah, and it wasn't that good, either." This about sums it up. There is nothing really wrong with this place, but it doesn't exactly shine. On the plus side, the BWDI&S was clean and very quiet--important properties in my book. The negative side was, however, perhaps too well represented--an odd lack of bath towels, a breakfast that was at best in the C-minus category, a puzzling lack of an elevator, and a slightly past it ambiance. Still, if you're going to be spending time in Dallas, there isn't a heck of a lot of lodging choice, and the BW is almost certainly the best hostelry available--though, yes, its prices may reflect the fact that it is basically the only game in town. Got back to our room at 11:30PM only to find that housekeeping had never been in it. Messy beds, no clean towels. I'm not paying $143/night for no service. Beds were rock hard. Bedding consisted of a sheet, a thin blanket and a comforter that was about the same as just having an additional sheet. No extra blankets were in the room. The towel rack fell of the wall in the bathroom. Will not be back. We were dead tired and hungry when we were given directions to this motel by a nearby gas attendant. She did us a great favor. The motel was quiet and clean plus being convenient. There is not an elevator but the young man who booked us in said that there was one room available on the first floor. Not ADA but the room was large enough that my husband was able to move about it in his wheelchair and the bathroom was spacious enough that we made it work. The shower had plenty of hot water, relaxing after a day's driving. The bed was very comfortable. Lots of pillows The young man who registered us in gave directions to Abby's Pizza. We could get to it without going back out onto the main road. And it was delicious, leftovers went with us. Breakfast was fine, I always like the waffles, my husband is not a big breakfast eater but OJ and coffee takes care of him. All told, the staff was friendly and helpful and our room and the public rooms were clean and looked to be newly refurbished. There are only 2 hotels options in Dallas, OR. The Best Western is by far the best!! I checked out their competition and was disgusted. 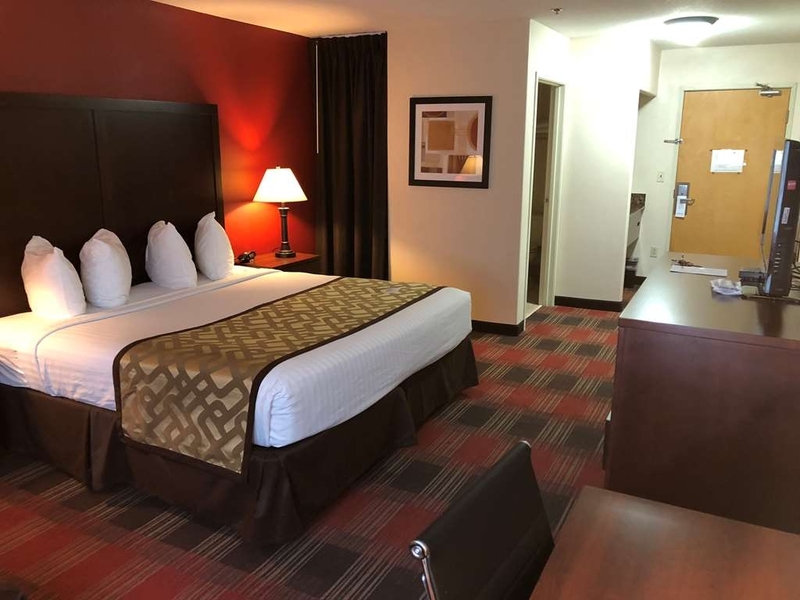 The Best Western in Dallas offers a good deal for the price. They have a very expansive breakfast with very friendly and helpful staff. We stayed 7 nights with 3 little kids and felt right at home. The staff was very helpful and understanding. They all went out of their way to make our stay comfortable, and relaxing. The manager let me use his work computer to print something because the lobby computer had a block on it. My kids made friends with the front desk clerk Rafa. He was so friendly and patient with my 4 year old who happens to have a crush on him. Rafa was also very helpful in recommending restaurants, activities etc. He knew the area well and I felt I could get honest information from him. They offered a portable crib for my baby to sleep in and offered to set it up also. Our cable wasn't working one night and Rafa was very prompt in changing out the cable box to allow us to access the big game and cartoons for the kids. We used the guest laundry room and the spa-pool and were very satisfied with both. We enjoyed our stay and would definitely recommend staying at the Best Western Dallas Inn & Suites!!!! Thank you for the feedback. We are very glad you enjoyed your stay. We spent one night here while visiting family nearby. Our overall experience was fine, but for the price I would expect a bit more. The room was clean, well maintained and comfortable. Breakfast was adequate- not interesting. The "pool" is the size of a large jacuzzi. Happy with the experience, Breakfast could be better and internet connection very slow. HVAC unit pretty noisy when cycling. Shower pretty good. TV size is good with good reception. M/W and Fridge in room. Could use extra pillows in the King bed. "Mislead by both Best Western and Hotels.com"
Was directed to this hotel by hotels.com when trying to book a hotel in The Dalles, OR. Didn't realize until 10 minutes after booking and trying to get navigation that it was booked in Dallas, OR. Called hotel immediately and was told they didn't get the money yet and for a refund I'd have to call hotels.com. Called them immediatly and was told by hotels.com that it was up to the motel to release funds and when they tried to call to get verbal OK, it was denied. Called motel again and asked why they wouldn't release the funds and then was told I would have to talk to a manager in the morning. Called again in morning and explained to manager and was given the runaround that he would have to OK it with the hotel chain and PROMISED to call back by noon that day.... 6 days later and still waiting..... Will avoid this place should I ever find myself in Dallas, Oregon. I was told at check-in that the rooms have been refurbished. I did not see the rooms before, but ours was definitely nicer than the guest photos on TA. Note that since they refurbished, pets are no longer allowed here. Our second floor room was clean, quiet, and the beds very comfortable. They could use another blanket on the beds. I am picky about shower heads and this one was very nice, had good pressure. The problem was inconsistent hot water. It was barely warm enough to stand under for a good 10 min, and that was with the handle pushed to maximum hot. Then when I was just about finished, and almost freezing, got a blast of very hot water and couldn't turn it down fast enough to avoid a scalding. My husband had the same experience when he showered about 4 hrs later. Not an issue for us, but note that this hotel does not have an elevator. Breakfast was OK. Typical hotel free breakfast with few healthy choices. Some fruit available, and only instant oatmeal (sugary flavors, had to search for the one plain packet). They also offered cold cereals, waffle maker, pastries/breads, biscuits and gravy, juices, and fairly good coffee. I would stay here again. An Okay facility, terrible breakfast, cold shower on Saturday but front desk didn't care. NO elevator to the second floor. Front desk was friendly on check in, not so friendly on check out. Beautiful area, hotel seems over priced for the value of the rooms and amenities. Dear Richard, Thank you very much for your review of your recent stay at our hotel. Your feedback is extremely valuable to us, as we strive to improve with each and every stay. I greatly appreciate your comments about cold shower and certainly we will check that .I hope that I can convince you to change your mind about another visit to our property. Please reach out to me directly at 503 400 5763 if you would be willing to give us a chance to turn your experience around. It would be such a pleasure to personally welcome you back to our hotel! "Great place for spur of the moment rest!" I needed a place to rest before driving on and it was lovely. I had to get a suite, but it was a great price! It's in a great location and the staff are very accommodating. There is ice and vending for the basics and plenty of restaurants close by. "Just expected more for what we paid." I guess if I wanted a $50 stay I could have booked the $50 motel in town. We were in town for an event and decided to check into the Best Western based on the rating from Trip Advisor. The nightly rates on Trip advisor seemed to change 5 times in 30 minutes so we just checked in. Our Bill was $150 including tax. My goodness this is just a best western. We decided to see what was so special. Big mistake. Next morning we went down for breakfast. The only highlight were the Waffles. We patiently waited for the couple ahead of us to make their waffles. The batter ran out with our first one so we let the guy know it was out. 15 minutes later he managed to refill it. Since we were waiting we tried the biscuits and gravy. Big mistake. Underdone biscuits and tasteless gravy. They were basically out of everything and the guy made no attempt to police the area or empty the garbage. I suppose that if you think you are worth $150 per night you should care about the services you actually offer or just don't offer them and provide a truly reasonable price for an evening stay. Despite the claim from the hotel that they 'updated' their listings to reflect they no longer accept pets, major travel sites still show pet friendly. Per the manager they have not accepted pets since July 2016. What would have happened if I had showed up with dogs in tow? Canceled my reservation and this hotel is on my list not to stay at again. I apologize for any inconveniences our Pet Policy change has caused. I have diligently researched our websites and its always my goal to make sure that they are all listing the same information. We strive to provide consistent information and the best of the best service to each and every one of our guests. The bed was among the best I've slept on in a motel and I travel a lot. I think they could use a bit better grade of shampoo and there was no lotion or conditioner provided but otherwise the stay was fine. The staff was great, the breakfast pretty standard and I skipped it. Not into cold cereal, waffles or biscuits and gravy, but I know other folks love it so no judgement from me. Thank You for taking the time to give us feedback. We are glad that you enjoyed your stay with us. And we are currently still doing Upgrades to our Property. One which includes new shampoo, body wash, and conditioner these are in dispensers that are being wall mounted in the shower. This will also include hand soap & lotion wall mounted dispensers next to the sink area. We look forward to seeing you again for your future rooming needs. "Nice facilities, friendly, helpful staff...great beds!" We visited so long with our family that it was almost midnight when we got to the motel. We were so tired when we arrived--what a joy when the night clerk came out to our car and helped us haul in all our stuff in one quick trip. The next morning, the day clerk then did the same thing for us when we left. Wow! Thank you for your feedback. We are very pleased to know that we meet all of your needs. We are here to serve. We look forward to seeing you again for your next stay. "No breakfast. Make sure bill is correct"
No breakfast due to person out sick...not our problem as a back-up plan should have been in place. Bill was incorrect & not split correctly as requested. The man as check-in was very nice. The woman at check-out wasn't friendly and didn't listen to requests and bill was completed incorrectly which she argued with me about when I had to call in to correct. Thanks for your feedback. I appreciate your feedback. We need to know when we exceed or don't exceed our Guest Expectations. We are working to be the best of the best. (We have been doing a lot of Computer based training to be more efficient at our jobs.) I hope that you will give us another try to impress you and earn your Business. The staff was friendly, courteous, helpful. 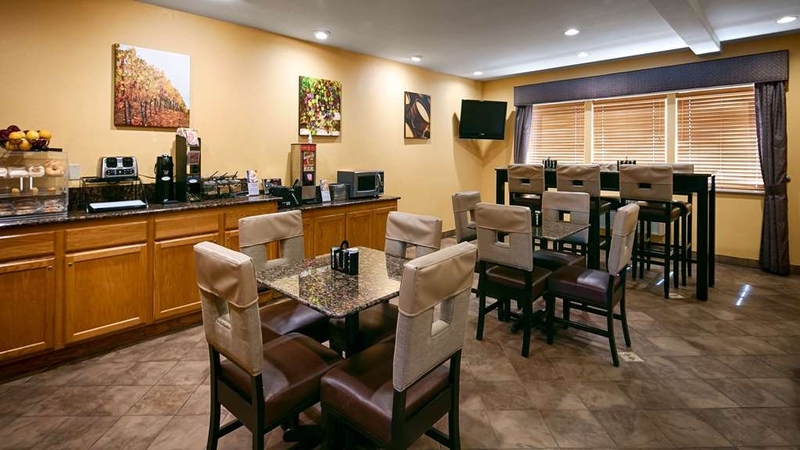 Clean rooms, nice hot breakfast, Wi-Fi, and free parking. I would stay there again, and if anyone in that area, please stay there. great place. The location is great. Could walk to grocery stores, drug store, restaurnats. 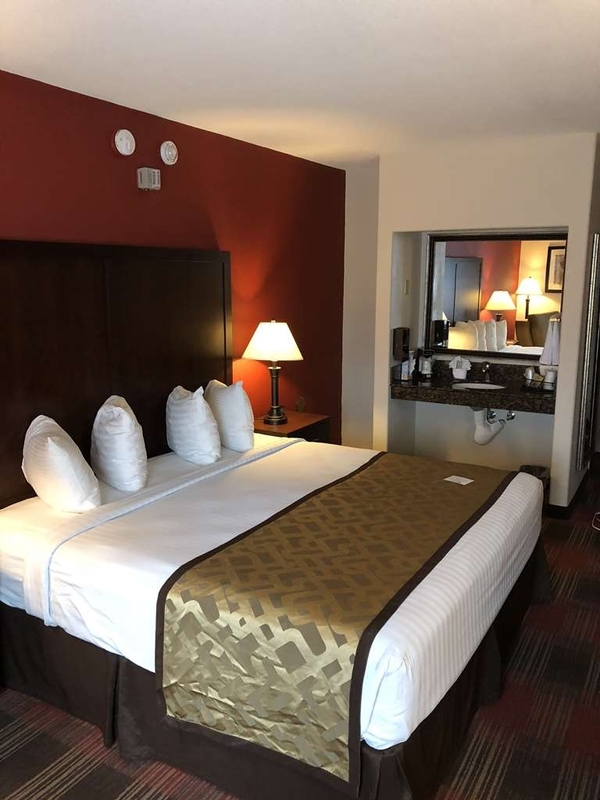 "2 nights in dallas oregon"
Thank you for the feedback :) We are very glad you enjoyed your stay. We were greeted by two friendly staff members when we arrived. Check-in was quick and easy. Be sure to ask for a 1st floor room if mobility is an issue because there is no elevator. 2nd floor room was large and clean. The bed was very firm but comfortable. The AC unit ran quietly on the "low" setting and was not a bother for sleeping. The bathroom was a bit bigger than average and the shower had good water pressure. The breakfast was below average for the price per room. I've stayed at many similarly priced hotels and had some pretty decent breakfasts and choices. Overall, I'd say this was a decent, comfortable hotel but the price was a bit high. Thank you for taking the time to give us a Review. We appreciate your feedback. We look forward to Seeing you again next time you are in town. This hotel is one of a couple in town and it is over priced. It was clean and an okay nights sleep but don't think I would stay here again unless I had no option. If I had known how close the nearest town is, I would have got a room there for half the price. If you need to be right in town, this hotel will do. I'm sorry that you felt that our Hotel is over priced. We make it our goal to do a analysis of rates in the area to assure that we are fair. I hope that when you are in the area again you will call us directly to book your room. Thanks for staying with us. We had a very dirty room. Chip bag with chips on floor under chair. When I went to talk to the lady at the front desk she was nice. She then talked to another woman that was making the breakfast. When told that the room was dirty she said " imagine they are lazy ". The lady then had me text her a picture and she said that she had texted it to her manager. The front desk lady said that her manager was going to give us a call. When I was packing up our things to leave I was looking to make sure we didn't leave anything behind, I moved the blankets from beside the bed and there were leaves and popcorn kernels along the bed and nightstand. Not my idea of a clean room. I still have not heard from anyone. I'm sorry that your stay was not a pleasant one. Our goal here at Best Western is to Exceed our Guests expectations. It looks like we have some fine tuning to do. I appreciate you letting us know about these items. I as the Manager accept full responsibility and will use these items as Learning & Training tools. I hope that if you are ever in the Dallas, OR, area again you give our team a opportunity to earn back your business. My wife and I visited on the 14th as they were the closest to the spirit mountain casino for the Huey Lewis concert. Our room was nice but when we had a problem with the toilet and needed a plunger, I went down to the front desk for assistance and the clerk told me they he would look in back but didn't think they had one. After going back to my room and and not hearing from him after 15 minutes, I went back to see if they had one and that's when he said they do not have one and there was nothing that could be done. These conversations with the clerk took place while some girl in jammies with bare feet was sitting on the hotel counter. I guess he gets bored at night and needs company. My wife did not want a portolet situation so I went ahead and found a coat hanger and was able to clear the problem myself. The night clerk here definitely needs some more training in customer service, problem solving, and professionalism. We asked for a call from the manager but have heard nothing. We had no problems with the day staff. Thank you, For your feedback. We have addressed the opportunities for improvement and have utilized this information for further staff training. I hope if you are ever in the Dallas area again you will give us the opportunity to give you the Wow Service we strive to provide to all of our guests. I would like to earn back your business. We have stayed at many motels, and this is definitely one of the very best. There has been a major redecoration, and it shows. We've stayed here many times over the years, and this time it was special. The front desk personnel and the staff have been wonderful to work with....friendly and accommodating. It has made our stay in Dallas a great experience. The person tending the breakfast room is great...can't say enough good about her. The only downside is that there is no elevator, but that is a minor inconvenience. We have thoroughly enjoyed our stay. The wifi works great, the rooms are spacious and very clean, the location is great. You won't be sorry if you choose to stay at the Dallas Best Western Inn and Suites! "Great place if visiting WOU in Monmouth"
My daughter and I were visiting Western Oregon Univ. to tour the campus and this was the closest hotel I could find that was of a major hotel chain. The staff was extremely welcoming and the accomodations were clean, comfortable and convenient. There are many small restaurants, FroYou and coffee places nearby; plus a Safeway and Goodwill across the street. With the in-room microwave, we never felt like a meal was difficult. If you plan to use the breakfast bar, make sure you check the times available. Thank you, We are very pleased you had a Great stay with us. Please let us know next time you will be in town. So we can book future stays for you. This is a wonderful gem of a hotel that I had the pleasure of staying in for 3 nights. I had more amenities than I'm used to at the higher priced chain hotels. My room was huge with a comfortable king sized bed and a sitting area with a nice couch and desk. Sheets and pillows were good quality and I slept very well. There's a one cup coffee maker, fridge and even a microwave in the room. There's also an iron and ironing board and a great hair dryer. The wifi was free and worked very well. The flat screen TV had tons of channels. The shower was super with great water pressure and hot water. Towels were soft and plentiful. The breakfast buffet had lots of choices and the biscuits and sausage gravy were especially delicious! The staff were simply amazing from the time I arrived until I left. They were friendly, professional and always greeted me with a welcoming smile. I would absolutely stay here again when I'm in the area. Thanks for taking your time to give us a Review. We aim to Please. I am proud of our property and our team. It is our Goal to meet and exceed our Guests expectations. We look forward to serving your Hotel needs in the Future. Overnight stop to catch a Drive In movie before the coast. Nice rooms and friendly staff. Bed was a little firmer than we like, but room was clean and spacious. Spa pool could have been a tad warmer, but was nice enough for a soak before the movies. "Great place for a rest"
24 hour friendly staff. Room was large with all amenities neat and clean. Even the TV remote was in a 'Fresh Remote' pocket. 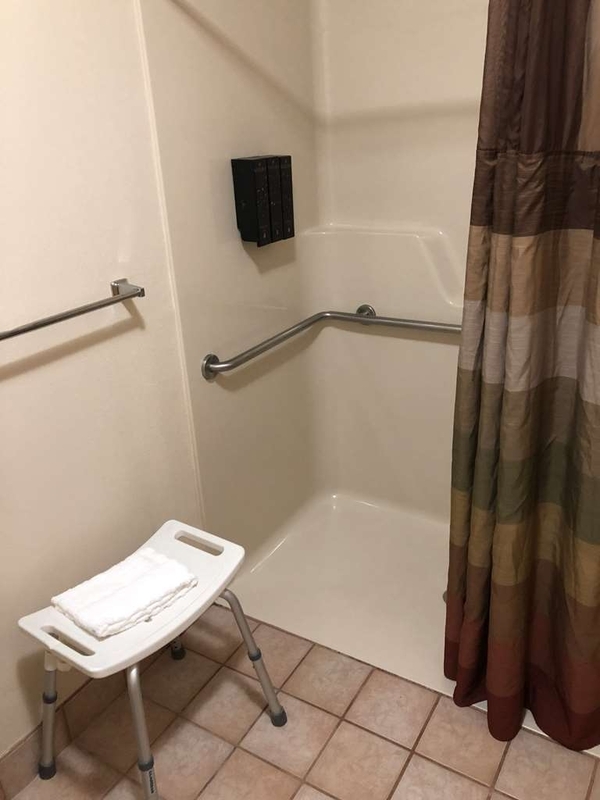 Shower is large and level with floor - good for wheelchair accessibility. Quiet room with no traffic to speak of during the night. Continental breakfast included: cereal, biscuits and gravy, waffles, juice,bakery goods and boiled eggs. Coffee, tea and free yummy chocolate cookies available at front desk. 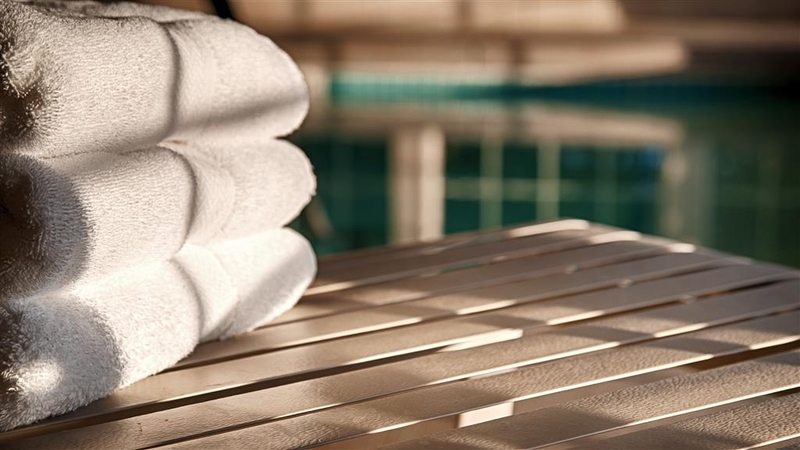 There is an exercise facility and spa pool open until early evening with towels provided. Laundry is coin operated. Free high speed internet to room. Hair dryer, ironing facilities, coffee/tea making in room, ice available in hall. Good heating/air-conditioning system in room. Restaurants and some shopping (Walmart, Safeway, Pharmacy) within walking distance. 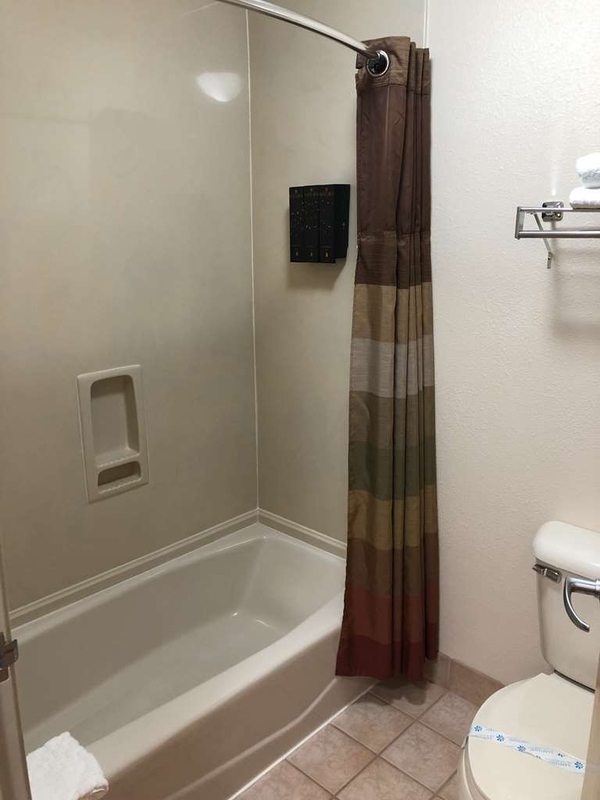 No toilet paper in the bathroom, the coffee maker in room had molded coffee grounds in it, kids running up and down the hall in the middle of the night screaming and no staff asked them to stop, no towels in the Jacuzzi area asked the staff to bring some and they never did. There were a lot of people checking in at the same time and check-in took a very long time!! 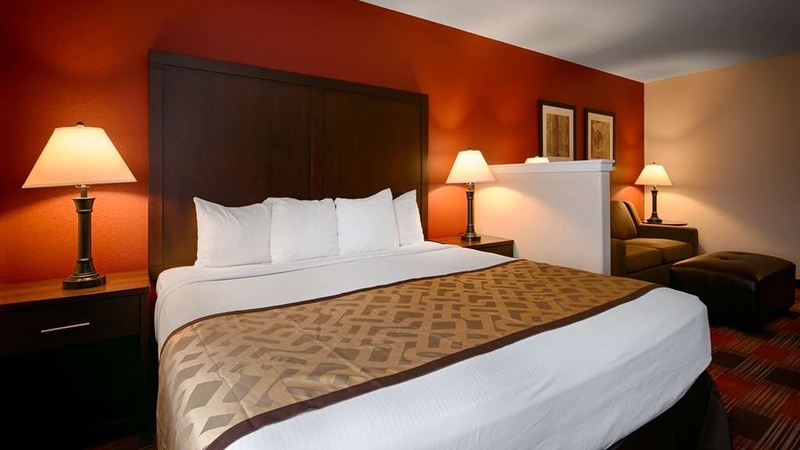 "Best place to stay in Dallas, OR"
This Best Western Inn is a real treat when staying in Dallas, OR. The amenities are excellent, the staff professional, the breakfast delicious, and the service superb. 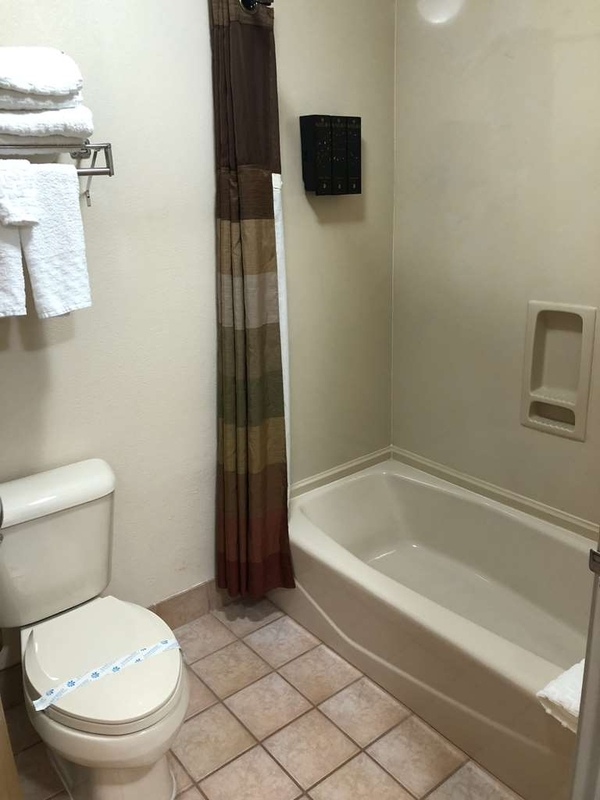 The location is also perfect; close to a Safeway, Walmart, restaurants, and the Dallas Retirement Village. The location, coupled with the service, makes this an ideal place to stay. We stay here every time we visit Dallas, OR. "Stay in Dallas, Dallas Oregon that is." Nice hotel. They are in the midst of renovating the rooms. The exterior is VERY nice, clean and well landscaped. For some reason my request for a first floor room (if no elevator) did not make it to them but thankfully they were able to accommodate us with a first floor room..
Nice to start work day with excellent breakfast, nice to have a spa tub to relax the night before. Nice to have a restaurant close by the night of stay. Great helpful staff. They worked with me on my believing Walmart had a contract with them and explained in a positive way why it wasn't and how I could work with Walmart for reimbursement. Even talked with Walmart management---I was not disappointed. Right now this place is getting a face lift, so we expected some noise. It hasn't been bad. The front desk staff is helpful. The room is clean and quiet with a mini refrigerator and microwave as well as a table and chairs. One concern is the arms on the chairs. They're not attached properly so when you try to scoot the chair closer to the table, the arm comes off its support. I think this is one thing they're addressing in their remodel. I hope so. The bed is comfortable, but a bit on the hard side. It's fine for my husband and me, but others may find it not soft enough. Good location for what we were here to do. The continental breakfast isn't much, but it was hot and the staff member assigned to the dining area was so attentive. This motel is probably a good motel. We were there for graduation and it was extremely busy. The motel appeared to inadequately staffed to serve all the customers. There appeared to be a problem on the second floor where work was being done. Wasn't much choices in this area but I often use Best Western because of their consistency of their brand. This place had good reviews so was a no brainer. All in All everything was good. Room was spacious, free breakfast was good with the ability to have pretty much everything you wanted except for breakfast buffet and grill omletes. They did have boiled eggs and egg sandwiches (to microwave) plenty of pastries and a nice waffle maker that was easy to use. Staff were very friendly and attentive. 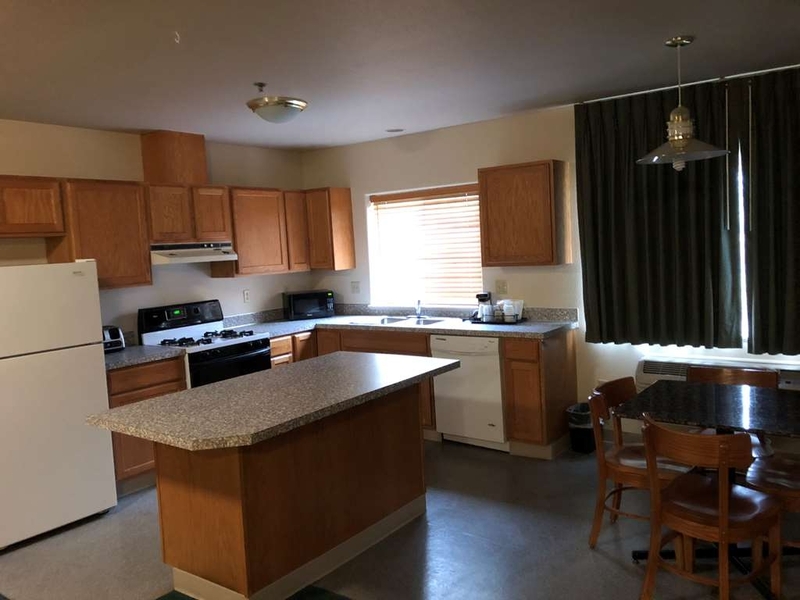 It's in a good location with a Safeway across the street and several diners also across the street and a Walmart also 2 minutes away if that's why you need. The only drawback was the maid service. My room carpet was not clean upon arrival although everything else in the room was fine. The problem is despite leaving a daily tip as I always do...the carpet still didn't get cleaned the next day. don't want to steer anyone away from this hotel for that but I also noticed the hallways were getting vacuumed daily. Management might want to take a look at these issues as it appears you may have an employee who isn't doing their job up to standard anymore. All of this was very noticeable but was over the weekend so perhaps management wasn't aware of it. "Hotel if going to Western Oregon"
Had better moments at this hotel in past. Closet Hotel to stay if Visiting Western Oregon, next to a Wal Mart and Safeway. I had friendlier staff the last time, which made the stay a lot better Rooms are very clean and beds are comfortable. Breakfast could use a better selection and someone to clean it every now and then. A group of us stayed there for a conference this past week. The hotel is really neat, rooms are spacious and the staff is really nice. We ended up needing some adjustments to our rooms at least three times because of the number of staff members that ended up having some conflicts. The changes were handled well and without any complaints. I hit the wong buttons on my TV and the desk clerk, Dustin, helped me get it set back up so the cable router was pointing the correct device. He got support on the phone and came up four time to solve the problem, just so I could watch a little TV! The next night I needed a plate and some hot water the the desk clerk opened up the breakfast area and got me what I needed. What a nice lady. I so appreciate the extra things when I am traveling. This is a great place to stay. The staff are awesome. They greet you every time they see you and ask if you need anything. We had a slight issue with the toilet plugging and when they couldn't find the plunger they moved us to another room. It turned out they had a work order in on the chairs and them not having the full details needed, the maintenance guy didn't get the whole job done when he came to fix a chair so I left a detailed description for him so he could do it. It wasn't his fault he didn't get it completed the first time. The breakfast is great as well. You can even make waffles if you so desire. The breakfast room is large, light and airy so you have plenty of room to relax and eat. 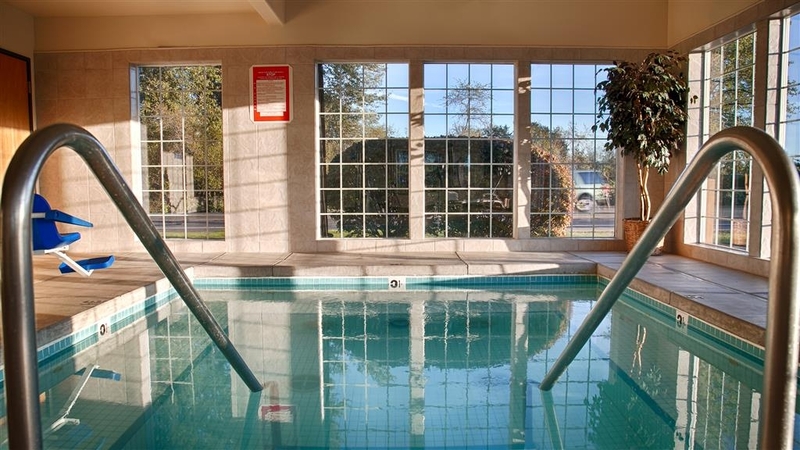 It has an indoor pool and small exercise room. The outside is clean and they have large half barrels of flowers blooming making it look like a very nice and well kept Motel. They also have a computer in the main room for those that need to use one and it has a printer as well. There is a nice area as well for sitting and just chatting or reading if you don't want to do it in your room. It's close to shopping and if you want to go to Salem for anything, it's close enough to the highway you can make it in 15 minutes. Talk about cleanliness! 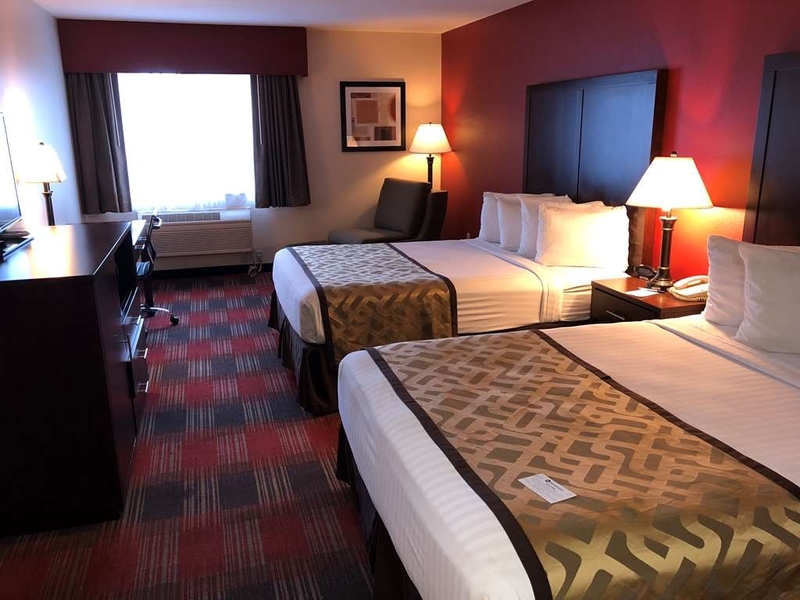 You shouldn't have to worry about the blankets on the beds as they have a sheet under and over them and the bedspread is neatly folded and draped across the foot of the bed. The pillows are nice and fluffy rather than so old they are flat like you will find in some motels. All in all, this is a great place to stay and if we get back over there again, that's where we will stay. Room was great! Very nice breakfast, many choices! Had some down time to enjoy a movie in room! But, No schedule in room for HBO programs! Didn't even no they had HBO until I did some channel surfing ... Would be nice for a program guide on TV. But over all a very nice stay! Great hotel all around, had great breakfast, very clean,quiet, close to stores. Staff very helpful and friendly. Fairly easy to find and get to. Not far from our convention area. I have stayed in two other hotels in trhe area and this is the best by far. This was a great experience! The staff is amazing.They were always wiling to help, friendly and professional. The breakfast staff was eager to help meet all dietary needs. The rooms were clean and attended to regularly. Parking was plentiful and the hotels proximity to local amenities is convenient. "Reasonable rates, good staff, good hotel for area"
Often stay here a couple times of the year when attending ham radio swap meets in Rickreall. 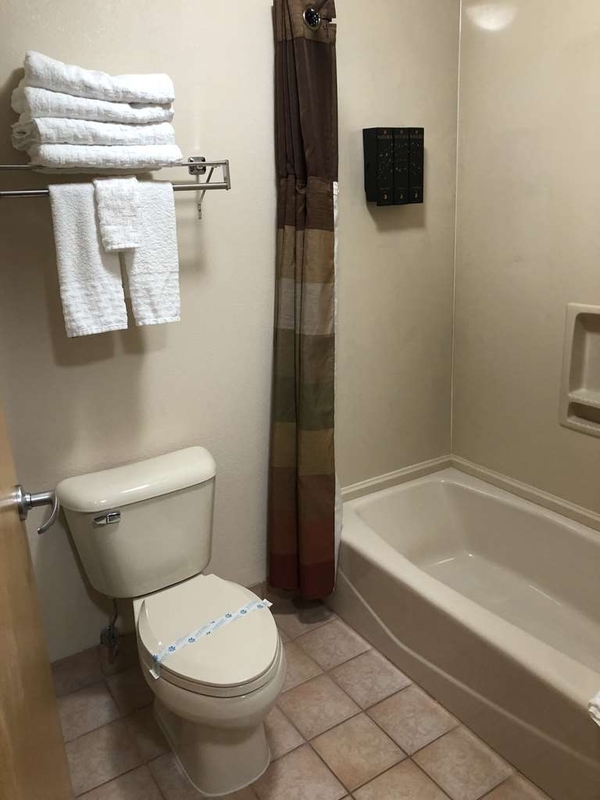 Rooms are clean, buffet breakfast standard, close to restaurants, and about 20 miles to casino. Staff are responsive, no elevators, free parking. Hotel was very nice. Only issue no elevator. the doors to the stairs were narrow when managing a large suitcase and caring a 50lb suitcase up the stairs was not fun. I have not seen a hotel this new without an elevator. One night stay for a weekend meeting. The hotel was very clean and comfortable. The staff was very helpful and friendly. I would stay again. The basic continental breakfast was suitable and the warm therapy pool was relaxing. Comfortable beds, nice water pressure in shower and great staff. 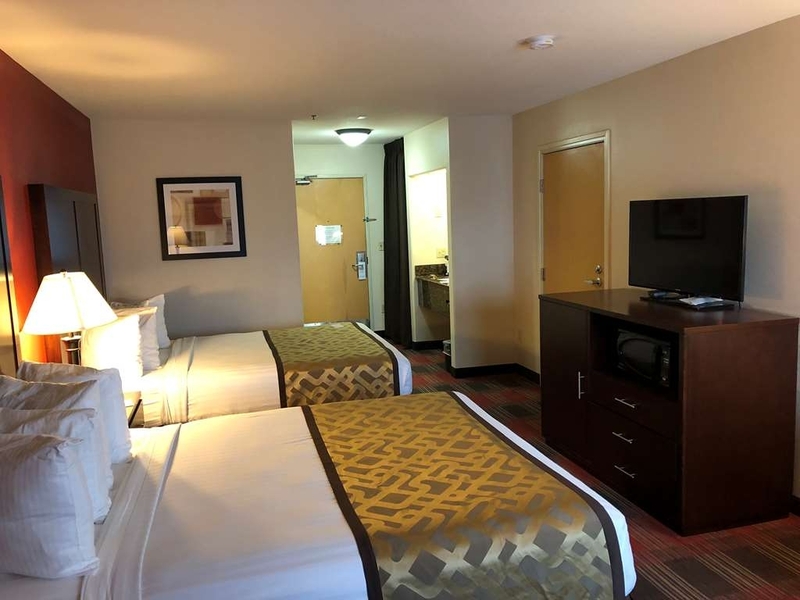 I stay at this hotel whenever I am in the Dallas, Monmouth, Independence area, which I am frequently due to property in the area and a daughter that goes to Western Oregon U. I am never disappointed by the service received. Fitness room and spa were out of order most of our stay. Had to pay for swimming and fitness at another location. When checking out they were going to email me a copy of my bill which I never received. Overall the rooms were clean and the beds were comfortable. 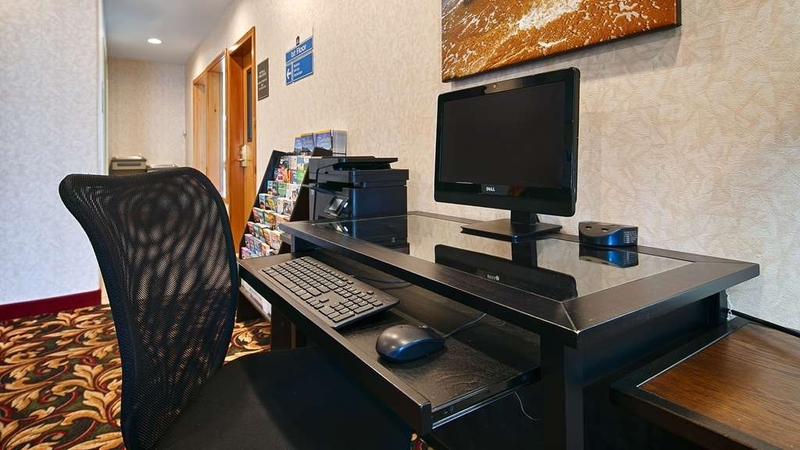 The Best Western has an excellent line up of staff and resources to meet your needs. We're a couple and I live out of state. The Best Western is home away from home and an excellent opportunity to build our relationship, as a couple. Lori is very resourceful and clearly explains everything as a friend rather than employee. There's also cookies at times, if you're looking for a sweet rate along with a delightful treat! We will continue to stay here because of the effortless customer service an accommodations! The bed was great and located away from any busy streets. Typical Best Western quality wise, which I like. Room is nicer than a motel 6 but not quite as nice as say a Holiday Inn Express (though very close). 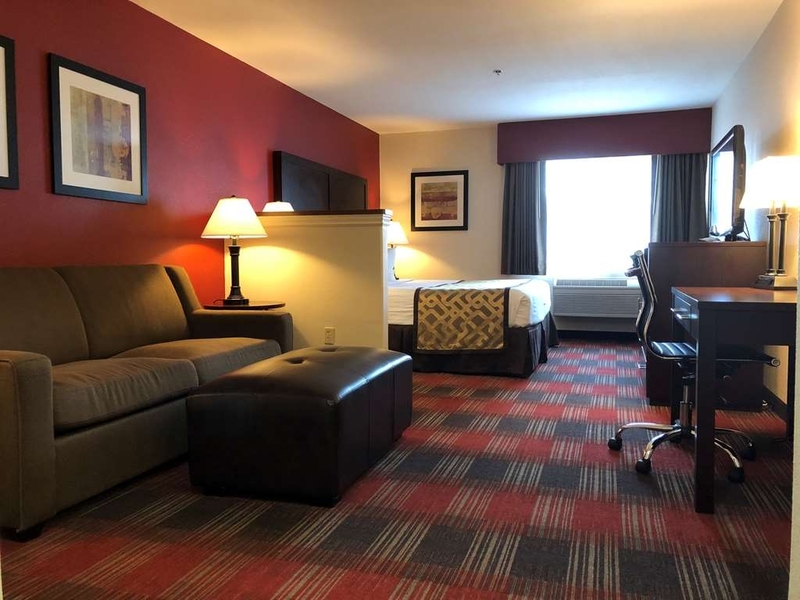 Best Western is a better value most of the time. I am always working out of town with my job and have stayed at several hotels throughout the years. I am a diamond member with choice hotels and have never tried Best Western. Since Dallas did not have a choice hotel, I decided to give Best Western a try. I could not be happier with this hotel. Laurie the front desk lady is so helpful and friendly, She made me and my coworkers fresh coffee and cookies on the cold rainy days. We are treated so well every week we stay here. I am now a diamond member with Best Western and Laurie always upgrades me. The rooms are also very clean. Five stars for this hotel from me and my entire crew. "Clean Rooms, Friendly Staff and felt very welcome and safe"
As a form Customer Service trainer & manager, I continually look for good Customer Service experience wherever I go. I have to say that Laurie at Best Western not only met my high standards, I would have tried to steal her away from the hotel to come work for me. I felt welcome, safe, and cared for at this hotel. The rooms were clean, the bed was comfortable and I will definitely stay there over and over again. Terrible, pretty well says it at. This is our last stay at your hotels.. It would really surprise me that this is the first complaint like this you have received. The sink was clogged, the housekeeper handed me a plunger when I told her about the problem. The refer had frozen-up and was defrosting on our food . The phone didn't work when we tried to call the office. The thermostat on the heater would not shut off. The orange juice at breakfast was not orange juice, but some watered down orange drink. This is not my idea of a restful stay, is it yours? "Not the best of Best Westerns I have stayed at"
"Lack of communication and service"
I checked in then attended a local group meeting. I received notification that I had a family emergency. I turned in my key, did not use room, clerk said she would write manager a note. No contact from manager, my room was simply charged even though never used. Even a phone call to talk about what might work equitably was not offered. I won't be back. "Go to Salem if you can"
Room was not clean - stuff on carpet and used soap in the bathtub. The refrigerator was very noisy. When I spoke with the desk clerk about it, she replied "This isn't a very nice place. I wouldn't stay here". Unfortunately, it's the only halfway decent place in Dallas. Go to Salem if you can, and skip this hotel. My stay was amazing., I got a king room with a large Jacuzzi tub. It was a great way to unwind and relax after a grueling professional training I had attended. Nothing beats a hot bubbly bath and a super comfy king size bed to make life better. 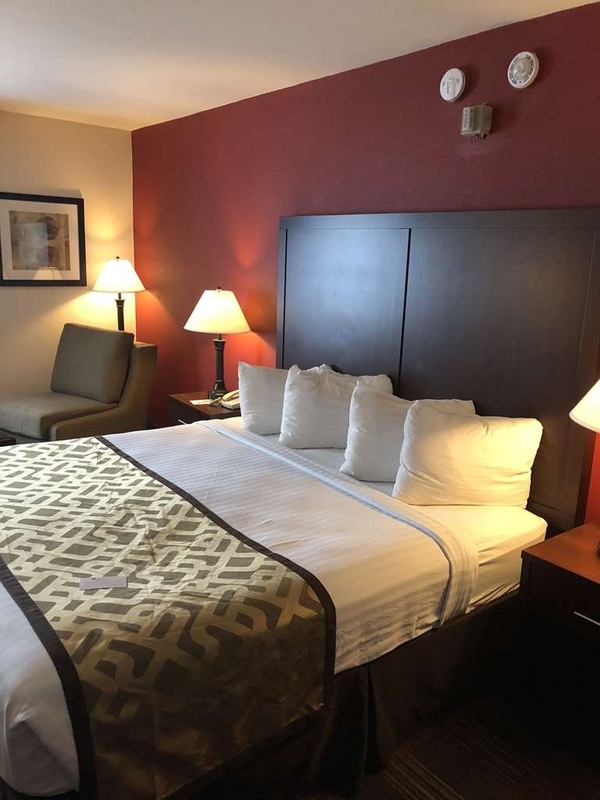 Hello Sally V, Thank you for telling us about your stay with us at Dallas Inn and Suites. 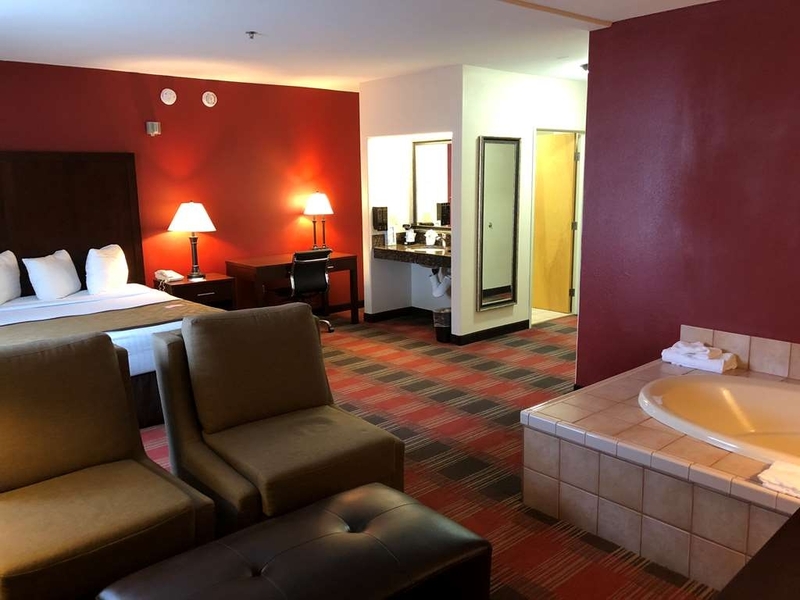 Our hot tub room is great for unwinding after a long hard day of work and travel. We are happy to hear that it served its purpose. Please let me know if there is anything we can do for you during future stays. Sincerely, Sarah Javins Manager. "Nice place to stay! Great Staff!" There are few places to stay in Dallas, OR, but I would stay elsewhere given the choice. It was an average hotel. The best thing about it is the friendliness of the staff, they were great. But the room, a non-smoking, smelled musty. Right on highway, so kind of noisy. Bed was comfortable. Did not take advantage of breakfast. All in all, I felt it was over-priced for the quality. For service, I give this place 5 stars. The gal at check in was very friendly and accommodating. The property however brings the overall score down. The front lobby looks pretty good but the rooms are clearly out of date and worn. As referenced in my pictures, the carpet in my room is in serious need of cleaning or replacement. Heavily stained, I did not want to walk barefoot on it. There were a variety of stains throughout the room. The hairdryer looks like it is from 1972 and attached to the wall. The shape of it made it impossible to attach my diffuser (which is necessary for my hair) so I went to the Rite Aid across the street and bought a dryer. Most of the places I stay have a regular dryer in the room or they have one at the front desk to loan out which makes my travel diffuser perfect. This place did not have a regular dryer at all. I luckily found one on sale for 15 bucks. The front desk employee offered to bring hers from home for me which was really sweet but I declined and bought the one on sale. The hangers are the kind that fit into a slot on the rail. I HATE these kind of hangers as it makes me feel like I am staying in a high crime motel and they are afraid people will steal the hangers. Sigh. My ice bucket was wet inside and the lid was dirty. The two chairs have very worn upholstery with holes. The bathroom was just as dated and worn as the carpet and the furniture. The refrigerator was a very nice size and the microwave was nice too. The free WIFI was definitely appreciated. "Very nice comfortable hotel, reasonable price"
For those that might read my reviews, we are not 4 star people. We are also very active and don't really focus too much on accommodations. Our criteria for hotels is that it is clean, comfortable and meets our needs in terms of price and access to the city or other activities. We would rather spend our money on activities, food and more travel than on high priced accommodation. We had been wine touring and wanted a hotel that was close to where we finished. 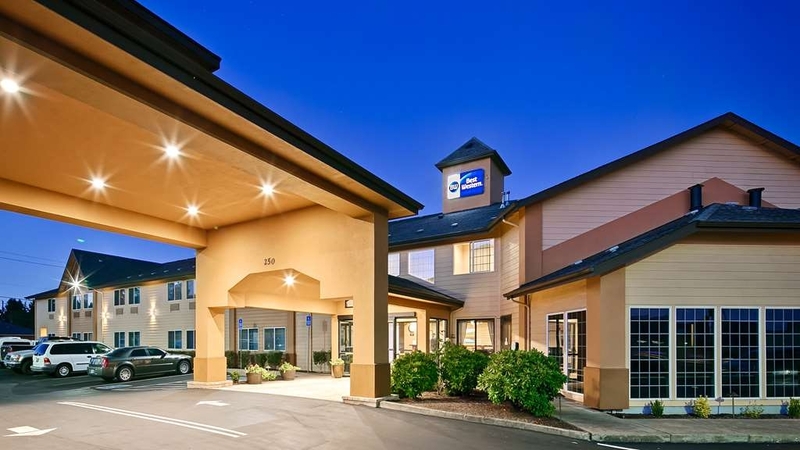 This hotel is on the edge of the Willamette Valley wine area and very convenient. Check in was great and the hotel room was very clean and comfortable. There is a Walmart and restaurants close by (walking distance). Town is very quiet. Breakfast was typical but good and service was good. We would come back in a heartbeat. They had an indoor pool which we did not try. Hotel was ideally located for our stay, and modernly decorated which we prefer! Check in was ok, not speedy, a little long winded. But the rooms were lovely and spacious with all up to date appliances and amenities. However, we were in room 153 which for some reason was ridiculously hot so it was unbearable without the air con on, but the air con made a horrific noise when it was on which made sleep difficult. Initially when we got in the room the TV remote didnt work and one of the bulb lamps blew, we told reception the next morning who promised to fix it in our absence but nothing got done throughout our stay. The bed was big and comfortable and the room wad clean and tidy. If your planning on using taxis, use the app Uber, dont call one from reception - they take forever! Would happily stay here again. Nice, spacious room. Comfy bed. Room had coffee pot, fridge, and microwave. Great breakfast included. Staff was friendly and no issues with check in or check out. Air conditioning unit was little noisy, though. 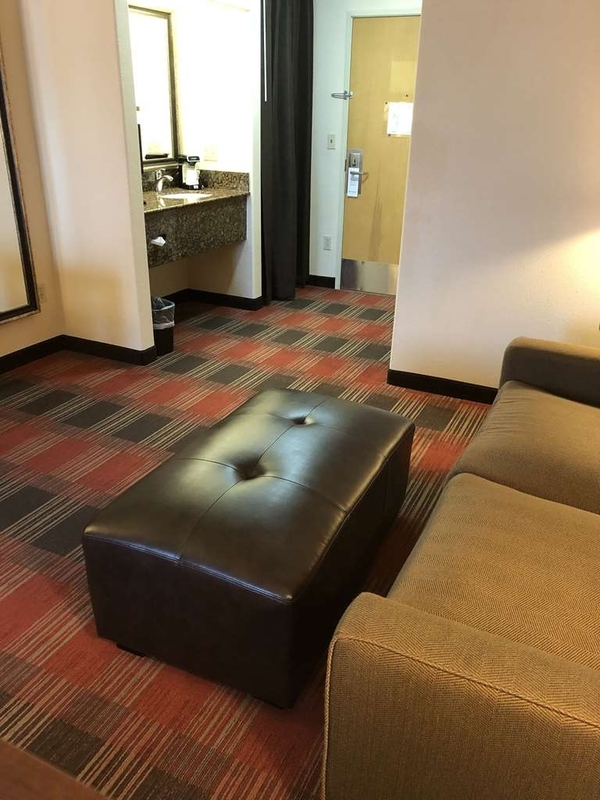 "Had an absolutely perfect stay!" Really great staff...they were all so helpful providing area information and Laurie from the front desk was a real pleasure and kept the breakfast all fresh and stocked...thank you Laurie! Will definitely stay here again and now feel I will always stick with Best Western on my travels. Thank you, Deanna Caviezel Happy Home Rental Services L.L.C. "Best Western Dallas Inn & Suites, Dallas, OR"
There are only 2 hotels in Dallas, Oregon...but this one is by far the best choice. You can't go wrong with Best Western, as far as I'm concerned. The pool is just a very, very large hot tub, but it is enjoyable. "Good hotel with Outstanding Staff"
This is an adequate hotel for a night or two with pretty nice beds in clean rooms. The rooms are no frills and don't get very dark or quiet. The breakfast is only ok, but all the staff are outstanding, friendly, and helpful. "Messed up reservation and bad attitude"
Reserved a king room and got a queen size with a little attitude. Told us we should have called the hotel instead off using the Best Western website (my fault) Alarm clock from previous guest went off at 4:00am (might be good to show the maid how to turn it off) No eggs at breakfast and the pool is slightly larger than a jacuzzi. The staff at the Best Western Dallas Inn & Suites was professional, helpful and friendly, great place to stay. I am in the process of moving to the Dallas, I am now convinced that this is a great place because of the staffs knowledge of the area and recommendations made. The local restaurants were within walking distance and great. The location of the Inn gives easy access to banks, restaurants, grocery and convenient stores. An overall great experience. "Exceptional Service brightened out day"
The front desk clerk at this hotel was very helpful in offering suggestions for things to do, restaurants, etc. She even made calls to find out the daily specials at each restaurant. She went out of her way to be helpful, and made out stay very enjoyable. She was very cheerful and welcoming every time we saw her. "seems to be only 1 in town"
if there had been another place to stay in town, we would have, but since we had no choice..but we didn't, so. This BW was like a Motel 6 with a paint job and a new sign. We did not partake of the breakfast bar so cannot give a review of that. "The Best is Best Western Dallas Oregon"
I have stayed there a number of times and have never been disappointed. This hotel is one of the few "Pet" friendly hotels in area. The rooms are clean, neat and nicely decorated and include a small refrigerator and microwave oven. The grounds are well kept including the "Pet" friendly grass area at the rear of the parking lot. They have a nice laundry alcove in the rear of first floor that is always clean and neat. 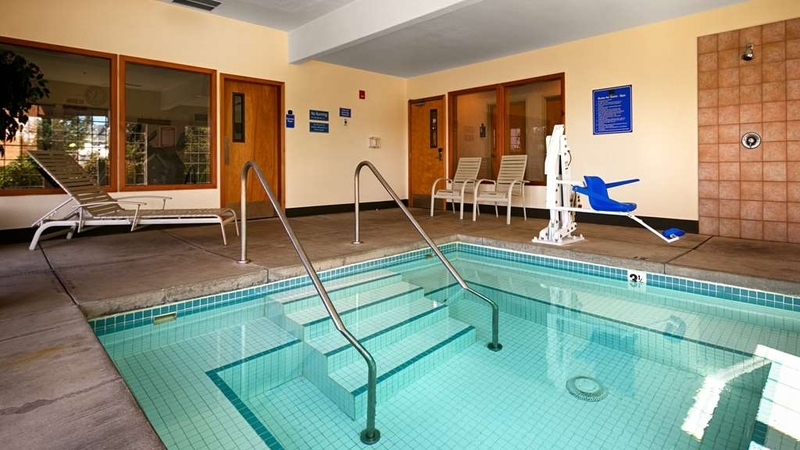 Best Western Dallas Oregon offers a work out room and indoor pool along with the very nice complimentary breakfast every morning. They are centrally located to shopping, gas stations, restaurants and within driving distance to Salem, Oregon the state capital. The staff of this hotel are courteous, friendly, professional and outstanding in every way I can mention. From the front desk personnel like Lynette, to the manager Sara to Matt who is front desk at night and prepares the complimentary breakfast offered by the hotel to their guests. My highest recommendation and strong encouragement to stay at the Best Western Dallas Oregon. You will NOT be disappointed! "Stayed there for a nearby vineyard wedding"
Laurie, part of the hotel staff, was very gracious and helpful. The breakfast was standard but well stocked and the fresh fruit was fresh. We all had fun in the oversized whirlpool, fitting in at least 10 of us. My family recently stayed at the hotel for a family wedding. We had at least 7 rooms reserved. The hotel staff went out of their way to make sure we were welcomed - even letting us hang out a bit extra in the pool after hours. In the hullabaloo of wedding details two of us left things behind. The hotel staff mailed our items back to us. Thank you for a great stay!